It is a truism in politics to say that older people vote. Almost exactly a year ago - the day before the General Election - we published a briefing note for our clients pointing out that with large leads particularly amongst older people, as well as among the affluent and those who owned their home, the Conservatives were in the dominant position as the country headed to the polls. Turnout is one of the most difficult parts of polling to get right, but history was unequivocal in suggesting that these groups were overwhelmingly the most likely to vote in a General Election. This gave David Cameron the advantage, whatever the headline numbers in the polls were saying, and Labour would need a change in behaviour of historic proportions in order to make it to Downing Street. It is in the same spirit that a number of commentators have written articles raising the prospects of an upset in the election for Mayor of London. Different arguments have been used, but the central thrust has tended to be that, despite Sadiq Khan’s lead overall, there are turnout advantages not picked up in polling which benefit the Conservatives and which could produce a shock result. While these arguments make intuitive sense, they make one fatal assumption: that demographic patterns in mayoral elections replicate those at General Elections. Firstly, it is important to point out that there are no exact numbers on who actually votes at elections. The paper copies of marked electoral registers are kept separately by local authorities and contain no demographic information anyway. Instead, we know who votes in General Elections because in places where the population is older, turnout tends to be higher than in places where it is younger. Communities with more middle class and affluent constituents have higher turnouts than more deprived areas. The graphs below show the relationship between the socio-economic make up of a constituency’s population, with the proportion of people who turned out to vote at the last General Election. As can be seen, the higher the proportion of constituents who come from the most affluent AB social grades, the higher the turnout was in the constituency. On the other hand, turnout was lower the higher the proportion of a constituency’s population came from the least affluent DE social grades. Now this all fits with expectation. But the rub comes when we run a similar exercise on the last mayoral election in 2012. If we look at the age profile of individual electoral wards, we would expect to see those with a higher proportion of older people have a higher level of turnout at the election. “Older people vote” after all. But if we look at the data, a different picture emerges. 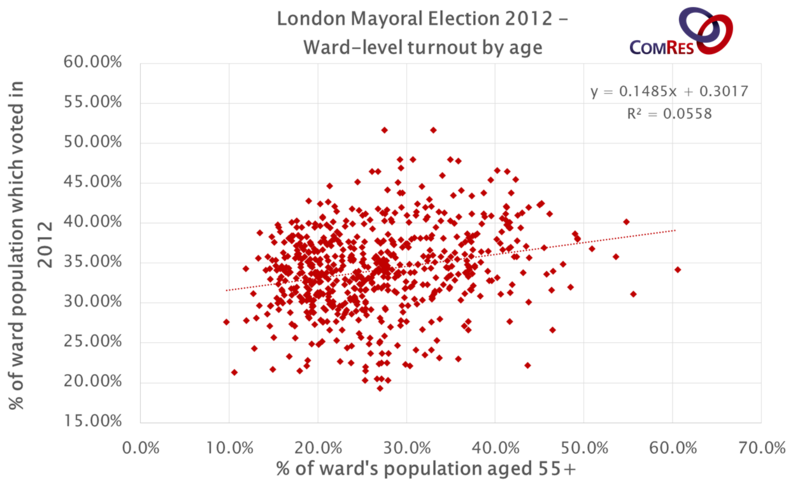 The graph below shows all the wards in London, and the relationship between the proportion of people aged 55 and over in that ward, and the proportion of people who turned out to vote. And the picture is surprising but clear: there was almost no relationship between age and likelihood to vote at the last mayoral election. As the graph shows, there is a very slight incline upwards in the trend-line as the proportion of 55+ constituents increases, but the fit is very loose. 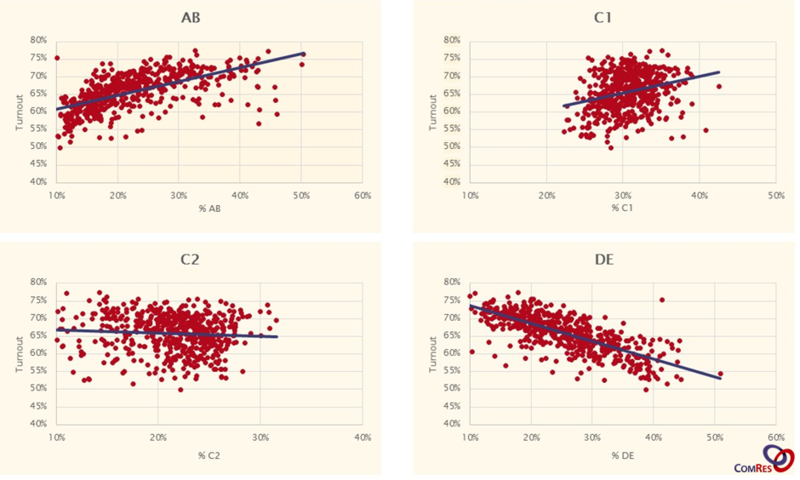 The individual data points are scattered all over the place, far from the line and indicating an extremely weak relationship – if any at all (this wouldn't pass a statistical test for the presence of a correlation). The case is similar if we use with proportion of 18-34 years – or for that matter, the proportion of a ward’s population which owns their home. 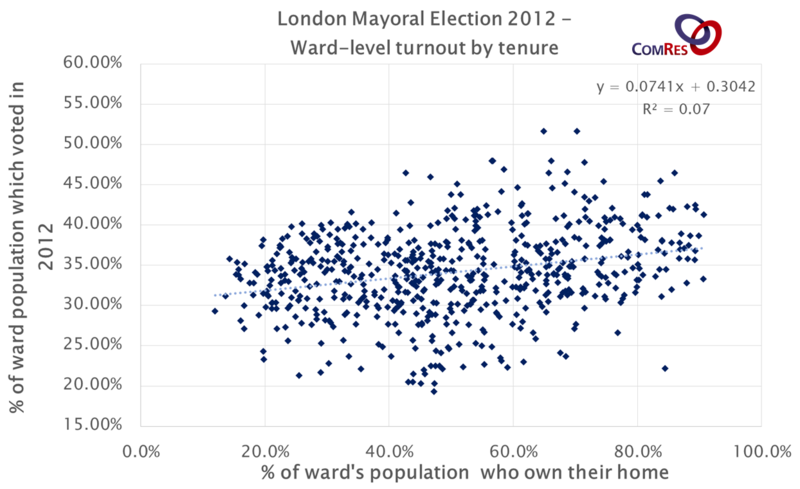 Despite some commentators suggesting people who vote are more likely to own their home, the data suggest this is not the case at mayoral elections. Another common trope is that “the doughnut may yet do it” for the Conservatives, with turnout being lower in inner London, where Labour does better, and higher turnout in the leafy suburbs therefore delivering victory for Zac Goldsmith. Again though, this claim does not really stand up to reality. 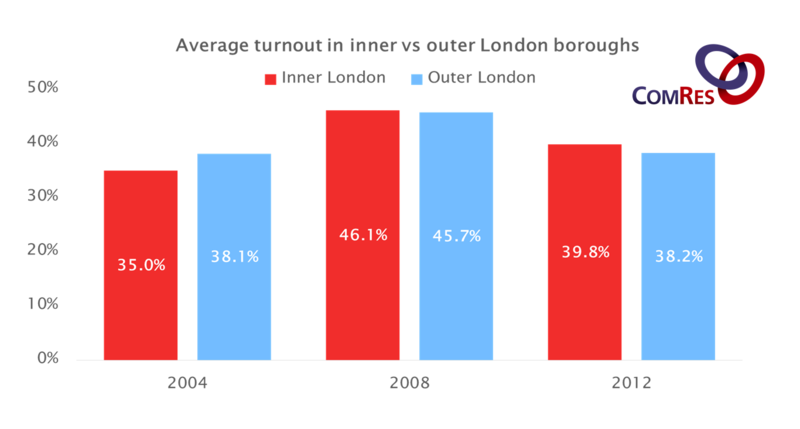 If we look at average turnout in inner and outer London boroughs, it has not been noticeably higher in the outer ring of the doughnut since 2004. In fact, at the last mayoral election, average turnout was slightly higher in inner London boroughs than it was in outer London boroughs. There is one final possibility, which has become a higher profile issue in the current contest than in the past: that there is a racial element in Londoners’ likelihood to vote. This is important because Zac currently leads Sadiq Khan by seven points among London’s white population, but is 31 points behind among BAME Londoners. If white Londoners were much more likely to vote therefore, there is an outside possibility that Zac Goldsmith could sneak a result. 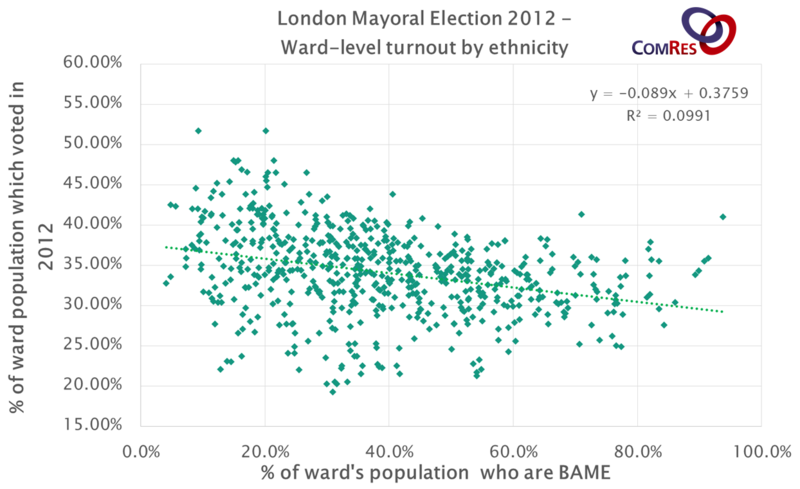 Once again though, the data suggest this is not the case – there was very little relationship between a ward’s ethnic profile and its level of turnout at the last mayoral election. The predominantly white wards on the left hand side of the chart below include the wards with the highest turnout – but also with most of the lowest. This is little to suggest that the predominantly BAME wards necessarily have a lower level of turnout than the London-wide average. Overall then, there is little relationship between turnout at mayoral elections and age, home ownership, suburbia or ethnicity. It is within this context that much of Zac Goldsmith’s campaign, which has raised controversy in some areas, should be seen. Seeking to link Sadiq Khan to Islamic radicalism is not necessarily about trying to get people to change how they will vote, but more to provide an incentive for older voters in outer London to go out to the polling station and to drive up turnout among Conservative-leaning groups. In turn, the hope is also to reduce the motivation to vote among Labour-leaning voters by creating an element of doubt in the back of the mind and to dampen enthusiasm (“I’m not sure I want him to be elected anyway”). The leaflets targeting Hindu and Sikh households are perhaps also similar examples of this - if not converting your opponent’s voters, at least reducing their affinity to him (or her). Of course, such tactics could also have the opposite effect. Rather than making Labour-leaning voters less likely to vote, Goldsmith’s campaign may have in fact motivated them to make the trip to the polling station in order to stop a campaign they see as racially-charged and perceived to threaten London’s status as a beacon of successful multiculturalism. Either way, if such tactics are to work, the Conservatives will need to overturn the turnout trends seen in 2012 to a very large extent. London is famously a city where relative wealth and deprivation sit closely alongside each other. Mews housing Georgian terraces meander into streets containing chicken shops, homeless refuges or housing estates; Londoners of all backgrounds subscribe themselves to the same crush of the Tube at rush hour. For whatever reason, London also has not the stark variations in propensity to vote between different social groups seen in national elections. Turnout may hold the key for Goldsmith, but it would represent a rupture of historical trend, rather than an expression of it. A version of this article first appeared on NewStatesman.com.